The drama class play this past weekend was fantastic! The cast was all prepared and their very best performance was the one for the audience. Amber was exhausted after a rehearsal day and performance day, still we managed to prevent a crash on Sunday by keeping her hydrated all weekend and letting her sleep as much as she wanted on Sunday morning. She actually has had a fantastic week during the afternoon hours too. It's been glorious to not worry constantly about her blood pressure. Too bad we started a slow weaning her from medications today in preparation for the June Mayo Clinic trip. Math has been going spectacularly since we switched to Life of Fred! Amber says its a lot more fun with almost no stress. My goal is not to necessarily make math fun, but to relieve as much stress as possible. While it all sounds so rosy now, even completing 2-4 lessons a day, she is still reviewing material already covered in Saxon Algebra 1. I'm waiting for when it becomes new material to see how happy LOF math makes her then. 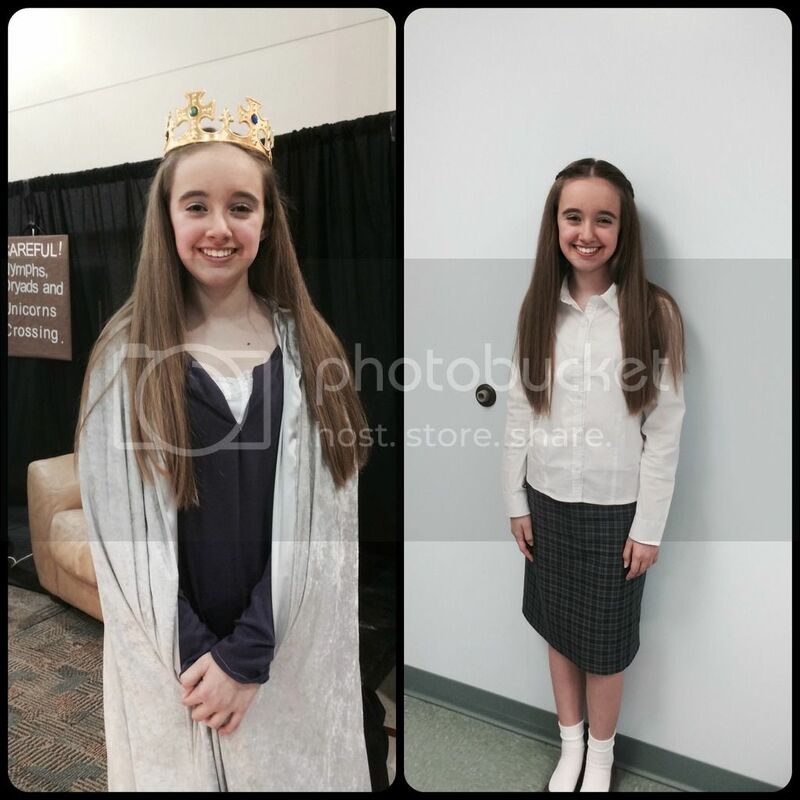 Amber as Queen Susan of Narnia and English school girl Susan. Saturday, before the play, in the pouring rain our mailman delivered a much awaited package containing our IEW level B writing curriculum. We were lucky enough to be selected to review such a great product. It's already been a huge hit with both Amber and me this week. Look for a review coming in June! Much of history this week focused on the Reformation, which being Lutheran, Amber had already studied several times. To mix it up a bit, we also did a few fun middle ages projects. Amber used an online Coat of Arms creator to design her own coat of arms that included a kitty cat, dragon, unicorn and cross. Only my child. Despite our new daily focus on language, Amber did go over two more geology lessons, without experiments, and tons of Life of Fred algebra. Amber finally had time to watch the Crash Course episode on the parasympathetic nervous system, which completes the set on the autonomic nervous system. It definitely helped her to understand the problems in her body and some of the treatments. I also had her watch the episodes on Connective Tissue as it is becoming more and more likely she will also be diagnosed with Ehlers-Danlos Syndrome (in addition to the dysautonomia already diagnosed) while up at Mayo. (left) I was busy and told Amber to make her own dessert. So, she did. This was after (bottom, right) she had an entertaining IEW lesson. Plus a kitty selfie... okay, so he didn't take it, but he was actually trying. Amber tested in German and started her next chapter. It feels so strange to still be going over these topics with her when my co-op class has finished their year in the same curriculum. A bit like deja vu. Teaching Amber individually is such a different experience from teaching a class. We go much faster at home than in class and Amber isn't getting as many hours of practice or assignment work as the class. I'm not sure if she just works faster or if it's the nature of at home lessons. In a couple of weeks it will be time to order the books for German 2. Amber will continue German over the summer and I might use our time at Mayo to begin prepping for next co-op year. Today Amber and I had our last symphony performance of the subscription season. We are both sad and relieved to have it finished. These have been special mom and daughter times for us, but they make for early mornings, a lot of driving, a lot of walking with stairs, and exhaustion for the remainder of the day. I think in the future we will purchase individual tickets for particularly interesting performances instead of keeping subscription seats. Amber does still believe they were a fabulous birthday present. It really is true that the best gift you can give your child is time together. Science: Crash Course on connective tissue and geology with our tiny cat. Plus errands: a much needed wash and inside cleaning of my car. Amber still likes to spray the elephant as my car goes by. For the first weekend in what seems like forever we have nothing planned except Amber is scheduled to acolyte at church. That we can handle. It's time to just rest and rest before the busy part of May comes up (Mother's day, multiple birthdays, teen outing, and a RUSH concert). I may actually deal with our landscaping this weekend, since it has dawned on me that I have no idea what plants are thriving and which aren't. I'm sure there are tons of weeds in the rock and many plants need trimming. I just haven't cared to even look for the past month. Perhaps I can even get Amber outside in the sun to help a little. My boys love Life of Fred! 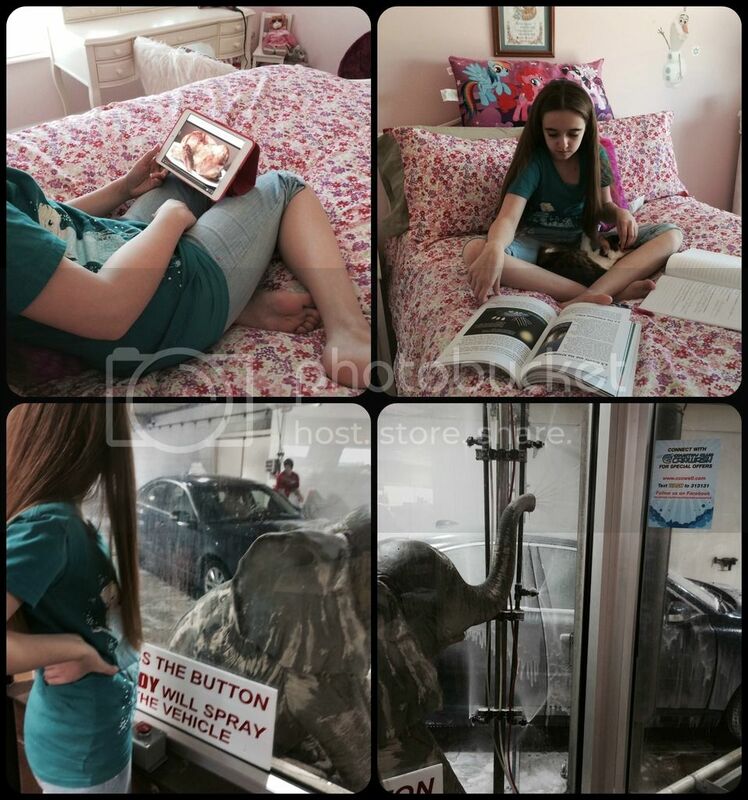 They're much younger, just 8 and 6, and this is our first year homeschooling, but they love Fred. :) Have a great weekend and thanks for sharing your wrap-up! Sounds like a really fabulous week with so much to enjoy in it! We like Life of Fred here too, although we don't use it as our main curriculum. I hope you have a lovely restful week end. She played Susan? Yay! Susan's such a caring, level-headed character to play...All the best at Mayo! Answers & treatment! I hope you and Amber are having a great weekend. I'm glad to hear that the play went well and that Amber got through it okay. I hope you girls have a fabulous Sunday! It sounds like you had a glorious week! How long will you be at the Mayo? 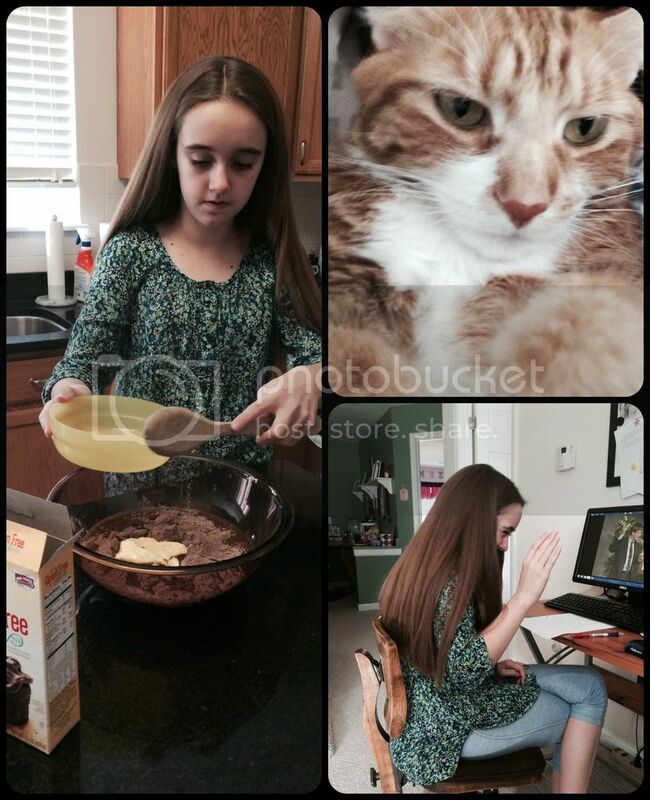 I know of another blogger who has Ehlers-Danlos as well as her two children. I don't know much about it, but I'm guessing its a challenging condition. I hope Amber does get a chance to get outside this week! Enjoy the weather! Life of Fred is AWESOME! I learned about them in college, when I used the LoF Calculus for one of my courses. I am currently using the elementary books (Apples, Butterflies, etc) with my son and he loves it : ).